It’s just the nature of the beast when you own a vinyl liner swimming pool; you’ll have to eventually replace the liner. Generally, liners on above ground pools and inground pools last for 8 – 10 years. In some cases, it could be less. In some cases, it could be more. It all depends on your chemical usage and how you’re balancing them in your pool. But, make no mistake, the #1 killer of swimming pool liners is poor water chemistry! Vinyl Liner Replacements are just one of the many swimming pool services that Penguin Pools preforms. The cost of a vinyl liner replacement varies on the type of swimming pool that you have: from shape and size, to inground vs above ground. And, most people would be surprised to hear this, but vinyl liner replacements are easier for an inground swimming pool than for an above ground swimming pool. 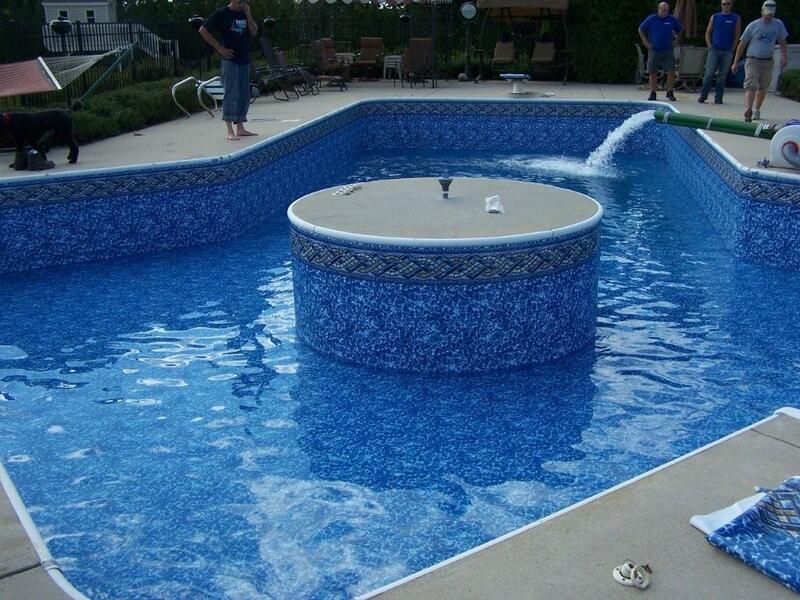 All inground vinyl liners are custom made to fit your pool, we don’t use “off the shelf” liners. The average vinyl liner replacement process takes 3-4 weeks from the time we measure to the time you have a new one installed. Measure the pool for the new liner. Send measurements to the designer. Designer creates layout and sends to processing (3-days). Liner is made, cut, and sent to shipping (3-days). Liner is shipped out to customer (6-days). Penguin Pools comes to install your new liner (1 day). Pool water is drained out. Old pool liner is cut out and removed. Bottom of Swimming Pool is patched if needed. New vinyl liner is installed and water added. Above ground pools are all made differently and each one has it’s own type of liner. Penguin Pools only installs beaded vinyl liners and many times there needs to be a conversion done to the above ground pool. Beaded liners are the most stable and most reliable, that is why it is the only one used on inground pools. Vinyl Liner is ordered, may have to be custom cut (3 days). Conversion of above ground pool receiver changed to accept beaded vinyl liner. Any decking around pool is removed. Portions of buried pool are dug out or bracing built. Vinyl Liner installed and water added to pool.